Founded in France in 2010 (hence the name), the company has since become a global top player contributing its share to the international market. Let’s take a look at what Le VPN has to offer. There’s so much to see here. Le VPN offers a variety of features that combine to make it a good VPN experience. Network coverage will never be a problem with Le VPN. They offer over 800 servers with IPs in 114 countries around the world on every continent. You can change servers at any time without any restrictions. Free VPN software developed in partnership with SparkLabs Viscosity is compatible with Windows and Mac. While you configure the software and learn the details, additional guides are available should you get stuck. Le VPN also includes a free iOS app for iPhone and iPad. This is quite practical because Le VPN allows two simultaneous connections on different devices. In July 2017, Le VPN even released an Android app. Peer-to-peer (P2P) and file sharing are therefore supported, although torrents and other P2P connections are only available in Canada, the Czech Republic, Luxembourg and the Netherlands. Innovative HybridVPN system to combine the protection of a VPN with the speed of a SmartDNS (more on this later in the review). There are three different price plans – one month, six months and one year the subscriptions can last. Each plan has the same features, so the only decision is how much you want to spend. The monthly membership costs $9.95, which is of course a less convenient subscription if you want to save. Six months for $7.50 a month and the annual plan comes to $4.95, which is a really interesting price for the many features. The payment methods supported include credit cards, PayPal and many other services. Le VPN also accepts payments via Bitcoins, which is a feature we always appreciate. Payment with Bitcoins makes you completely anonymous and untraceable. This is perfect for a VPN service, which is there to protect your online security. 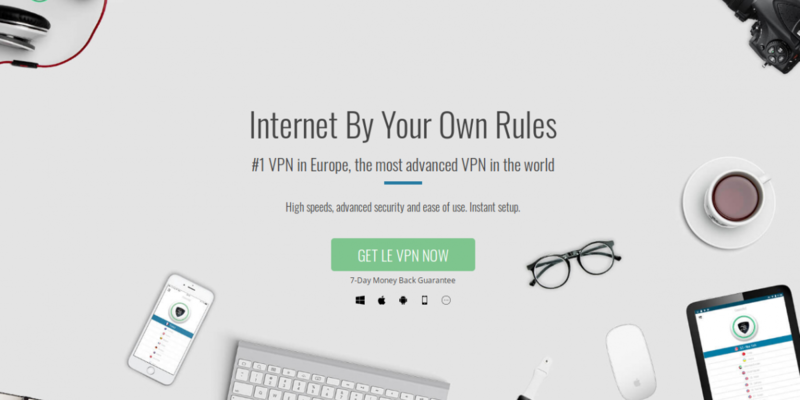 Le VPN offers a 100% money back guarantee for seven days, which you can use as a sample. No matter which plan you choose, you can always get your money back within these seven days if you are not satisfied. The procedure is also very easy for beginners in VPN matters and you will not have any difficulties the first time. To register you only need an e-mail address and a password. Then you choose the payment method. No personal information is required, which contributes to the protection of your privacy. After you have registered, there is a dedicated client area on the Le VPN website from where you can download the client. To download the Le VPN software, click on “Support” in the upper menu and select “Start with Le VPN” from the drop-down menu. You will be taken to a page where you can choose which installation you want to do. LeVPN has software for Mac OS X, Windows, Linux, Android, iPhone and iOS, Chromebook, Windows Phone and DD-WRT routers. After you have downloaded and installed the software, a pop-up window opens in which you must enter your user name and password to access Le VPN’s service. After logging in, you will see a welcome page. This page shows you some information on how to get started with Le VPN right away or, if you want, what tutorials are available to help you get used to the service. The website is quite intuitive and easy to navigate, so we believe you should have no problems finding your way to the login and download area. As a short note: You can find the client area under “Support”. When you hover over the menu, you will see a drop-down menu where you can find the client. To be honest, the font size in the menu (maybe even on the whole website) could have been slightly larger. The rather fast client offers many technical options. Whether you install Le VPN on Mac or Windows, the vendor uses a version of the Viscosity VPN Client. Viscosity software is not available for Linux. The client gives you absolute control over the service of Le VPN. It’s not the most user-friendly client on the market, but if you play with it a little bit, you quickly get used to it and get to know all its functions. To access the client, just click on the icon in the Top Bar menu (after you have installed the software, the icon will appear there). If you click on the icon, you will see a drop-down menu that opens a list of the main regions of the servers. Once you select a country you want to connect to, you can see all available VPN servers and the different VPN protocols supported. The VPN protocol you choose will affect your speed and security. For the best possible security, choose OpenVPN, a little less security, but higher speed you get PPTP and for combined speed for streaming content and security you choose HybridVPN. The features of HybridVPN will be discussed in a while. Before you can connect to a server, you will be asked to enter your username and password. The same happens every time you connect to another server, which is quite annoying. To speed up the process, you can add the log-in information to your keychain. One of the special features of Le VPN is the innovative HybridVPN service – a mix between a SmartDNS and a VPN that offers the fastest VPN connection. Unlike a VPN, a SmartDNS allows to change the region without device configuration, while the user can still access local pages. For example, you can access TV channels and streaming services that were previously inaccessible to you. HybridVPN combines the two and reaches your traffic through a VPN tunnel, while it can automatically unlock all online media via SmartDNS Server. Just to give you a practical example: If you want to access locally restricted streaming content, you will normally need to connect via a VPN in the appropriate country. With HybridVPN it doesn’t matter where in the world the server is – the SmartDNS in HybridVPN easily unlocks the content for you. This means you can continue to enjoy the security of a VPN connection and simultaneously access limited online media at high speed. It was to be expected that the speed would drop a little when Le VPN was activated, but it was absolutely surprising that the difference was so minimal. We performed all tests with the same VPN protocol. 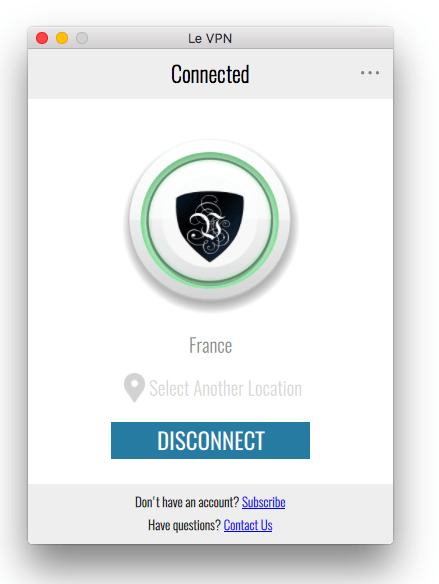 In this case, we have connected from Europe via the Hybrid VPN. The most important point of every VPN service is also fulfilled at Le VPN: Ideal security and good privacy protection combined with very welcome additional functions. What immediately attracts our attention in terms of privacy is the statement that Le VPN guarantees absolute confidentiality by not keeping any logs. According to their ToS page, they do not monitor user sessions for inappropriate behavior, nor do they keep any logs of customer activity. In addition, they do not store any private information about emails, chats, visited websites, and so on. However, Le VPN reserves the right to investigate activities if they suspect that they are illegal. In terms of security, the service has multi-protocol support. They offer the standard OpenVPN protocol, which is mainly used for desktop devices, as well as L2TP over IPsec and PPTP protocols to secure mobile devices – in addition to OpenVPN. Thanks to the AES-256 algorithm used for encryption, third-party intervention is avoided. Le VPN offers a consistent VPN experience that is relatively fast, secure and easy. As with any service, we have found both pros and contras. There are many things you can like about Le VPN. A large server network to choose from, for example, is a huge plus. The HybridVPN feature was a winner right from the start because it combines the best elements of a VPN and a SmartDNS. There are no logs of your activities, so you can enjoy the server with complete peace of mind in anonymity. Two simultaneous connections on two devices is a very nice extra. You are asked for the credentials every time you want to change servers. All in all, Le VPN is a reliable solution. It’s great for users who have limited access in their country and would like to access social media, for example. It is relatively convenient for online media streaming as there are a large number of available servers and a good speed. While VPN is not the cheapest, it is by no means the most expensive. If you can get one of the frequent special offers, the service is always worth it. Besides, with the seven day money back guarantee you have no risk if you just want to try it out.